Paulo Rocha was born in 1935 in Porto, Portugal, just two years after the beginning of the Estado Nuovo political regime. Early on in his career the seeds were already planted for what was to become a lifetime of filmmaking influenced by other cultures, other lives and other ways of being. After studying filmmaking in Paris, he was an assistant for Jean Renoir on the 1961 film The Elusive Corporal (Le Caporal épinglé). He then travelled back to Portugal and worked under fellow Portuguese director Manuel de Oliveira as his assistant. Later he would go to Japan, where he was given the role of Cultural Ambassador for Portugal, and many of his later films are influenced by Japanese culture. In Paris this month his films were presented by José Manuel Costa, current director of the Portuguese Cinematheque, a position that Rocha himself had also held in the undoubtedly turbulent year of the fall of the dictatorship: 1973-1974. Like his friend Manuel de Oliveira, Rocha died at a ripe old age. He was 76 when he made his last film, a year before his death. Oliveira still beat him by thirty years, making films almost until his dying breath, at 106. Rocha’s working life is marked by two periods – before and after the fall of the regime of Salazar (1933 to 1974). His first two films are set in Portugal in the 1960s. They’re in black and white and are mostly notable for the way they make rural simplicity look stunning by capturing the light at different times of day. This could be seen as a reflection of his education: part of Estado Nuovo’s programme was to teach young people to hold strong to rural values as well as to religious ones. His second period, which began after a quite substantial pause between 1966 and 1982, is marked by the use of bright colours, in line with their themes, which often deal with voyages and journeys to new places. I’ll be briefly discussing five key Rocha films: The Verdant Years (1963), Change One’s Life (1966), The Island of Love (1982), The River of Gold (1998), and The Heart’s Root (2000). In 1963 Rocha made his first film, The Verdant Years (Os Verdes Anos). It is one of the most important works of the Novo Cinema movement in Portugal, otherwise known as the Portuguese New Wave. A young man arrives in the Portuguese capital and falls in love with a girl a few years his senior. It features the city of Lisbon much as it is today: the rooftops of buildings overlooking its famous castle, the planes flying low overhead, the people eating tremoço and drinking beer in cafés. It’s at once hopelessly romantic and romantically hopeless – a reflection of life within set borders and a set time. His second film, Change One’s Life (Mudar de Vida), written by another Portuguese director, António Reis, is the story of the difficult homecoming of a vulnerable man who returns from Africa to join his family in a fishing village near the seaside. It’s especially remarkable for the scenes that take place in and around fishing boats, which are filmed with a seemingly intimate knowledge of this space and craft (shot by DoP Elso Roque). These first two films are heterosexual love in black and white. The camera focuses on beautiful girls who stare into their loved one’s eyes. Their lovers always have their backs to us, which allows us to appropriate the male gaze with ease: her “I love you’s” are addressed to us. But alas, they can’t be together – impossible love makes the sickly sweetness go down more easily, with exciting, and suitably dramatic endings. In Rocha’s films men say to women “Come away with me, marry me, be mine”, and the girls always turn their heads – they can’t, although they want to. One can’t help but feel that this atmosphere of slight repression and yearning is a reflection of the political situation in Portugal at that time. These two films go a long way towards capturing Portuguese daily life in a time when censorship was rife (Rocha too was censored). Their confident artistic style and lack of a clear narrative line sets them clearly in the European New Wave genre, which makes Rocha’s subsequent change of style all the more surprising. In 1982 Rocha made his first big production in colour – a Japanese-Portuguese coproduction called The Island of Love (A Ilha dos Amores), initiating Rocha’s aforementioned second period of filmmaking. It’s a somewhat epic 169-minute feature about the life of Wenceslau de Moraes, a Portuguese poet who lived and died in Japan. Rocha’s hyper-awareness of colour that marks this second period comes to the fore. In one scene, Wenceslau, wearing chest armour, is talking with a painter wearing a black beret. The painter is sitting in front of a large canvas filled with earthy colours – greens, browns and blues – as they discuss the colour pink. In the background, a Portuguese woman who is later to become a bigger part of the story listens carefully. She is wearing a white blouse and a long pale pink skirt. Rocha also uses a kind of magic realism. Though surprising, it marries well with his newfound use of colour. Via the flamboyant style of this film, Rocha gets away with unbelievable scenes of poetic recital that other directors would have trouble pulling off. The River of Gold (O Rio do Ouro), is surely his most famous film. It was accepted for the Certain Regard category in Cannes in 1998 and the film floored journalists, who wondered why it wasn’t included in the official programme. The first hint of the importance of colour comes in the first five minutes of the film. A woodsman is walking along near the river, and a voice begins speaking to him. It turns out to be a single long-stemmed red gerbera daisy which cries out for his attention. He picks it. In the next scene he marries a red-headed siren, Carolina (Isabel Ruth). The line between something a little too try-hard dramatic and something that just works is blurred in this film, but Rocha manages once again to get away with it. The next breathtaking scene about colour is to do with black – it appears during pan shots of the river, in which a boat with a gigantic black sail suddenly appears out of nowhere – at once ominous and hauntingly beautiful. In another scene – an uncle hauls his pregnant niece onto this very boat after she has nearly drowned. Her almost-naked body is covered in very black mud, which he incestuously rubs all around her body while giving her some very involved mouth-to-mouth resuscitation. In The River of Gold black is not death, but it’s still chilling. 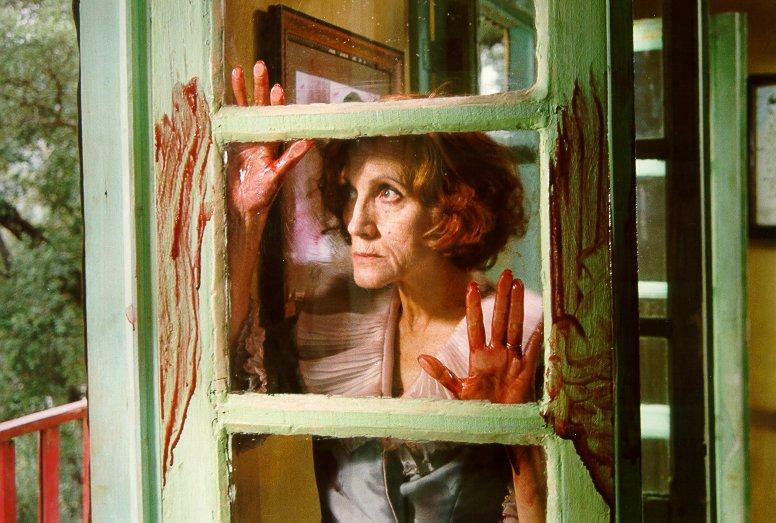 The fine line between artistic use of colour and plain childish delight in it is crossed at the end of the film when the main character gleefully takes handfuls of blood and smears them across the green and blue walls of her apartment. What’s strange is that it’s not particularly visually stunning – the blood is realistic and so it’s brown against dark green. But this is a trope of Rocha’s colour films. Smearing blood on walls becomes a symbol of both power and wretchedness – its dull colour a dreary reminder of pain. Rocha’s film from 2000, The Heart’s Root (A Raiz do Coração), starts off well enough. In the centre of touristic Lisbon, a political campaign is at its height. We are immediately confronted with many well-known images of Lisbon: the top of the Santa Justa tower, the Praça do Comércio and the streets around it. Election fever. Transvestites each wearing a wig of one of the colours of the rainbow run amok at a local party, where they take the men away from their female partners and dance sensually with them. Soon the police arrive. But somehow Rocha goes too far in this film. The line that he seemed to be toeing in the previous films, especially in terms of colour, is crossed into the territory of unstylish kitsch and unfortunately this one, starring Melvil Poupaud, is probably his least aesthetically pleasing one. Rocha’s second-period films are a burst of light.There is no doubt in my mind that this is a change reflects the achievement of political freedom. Sexual freedom is also represented via these films, certainly – The Heart’s Root with its transvestites and transexuals and 2004’s Vanity (Vanitas), about a lesbian relationship. This work demonstrates a radical shift from someone who grew up under a dictatorship that taught strict Catholic values. Rocha’s films are worth the journey. The first period is said to have influenced and been influenced by the French New Wave – and the works are especially reminiscent of some of François Truffaut’s later films. The second period is a bit like a dear friend showing you how to see colour again for the first time. Not only does Rocha share with us some beautiful cinematography, but also a keenness and passion for the world, and an open spirit.